The Murray River rapids remind us of the force of nature whilst its tranquil pools invite us for a cooling swim. As walkers easily stroll along the flat old railway formations it is easy to imagine the busy-ness of times gone by when steam trains chugged along the same place that your foot falls now. Conversely, the steep hills that challenge some walkers in the Murray River Valley will focus attention on the changing nature of the Australian bush and how well deserved a rest at the next campsite will be. A longer section between towns - seven days/ six nights - this section gives walkers a feeling of being a little more remote - a walker can struggle to find a phone signal here... bliss! This stretch of the Bibbulmun Track will take you through dramatic scenery, to places of Nyoongar Aboriginal significance, and past many pioneering relics of the timber industry. Between Dwellingup and Collie the Track follows the Murray River for some 50km. The Murray is the largest river in the Darling Range with no dams, and provides expansive valley views and tranquil riverside scenery. Just south of town, the Track enters the Lane Poole Reserve. Melaleuca thickets and flooded gum woodlands fringe the river. The Nyoongar people used this fertile river valley as a natural access route to the inland wandoo woodland hunting areas, but spent little time on the jarrah-covered bauxite plateau. They visited in winter when the creeks flowed, and they fished along the rivers of the Darling Range and estuaries of the coastal plain. The settlements of the new colonists focussed on pastureland at the fringe of the forest. Long Gully Bridge is a rare example of a curved timber railway bridge in Western Australia. The Track then used to cross the Murray over the Long Gully Bridge (destroyed by fire in 2015). The Track now crosses the Murray River on the Bilya Djena Biddi suspension bridge further downstream and then follows the river south until it reaches the Harvey Quindanning Road, a popular starting point for day or overnight walks. Soon after, the Track passes under the Worsley Alumina conveyor. The conveyor transports bauxite (naturally occurring aluminium oxide) from the Mt Saddleback mine to the refinery. South of Possum Springs campsite, walkers pass through an area burnt in a joint Department of Conservation and Land Management/CSIRO fire research project in 1998 (Project Vesta). Today the area demonstrates the capacity of the jarrah forest to recover from a hot summer burn. 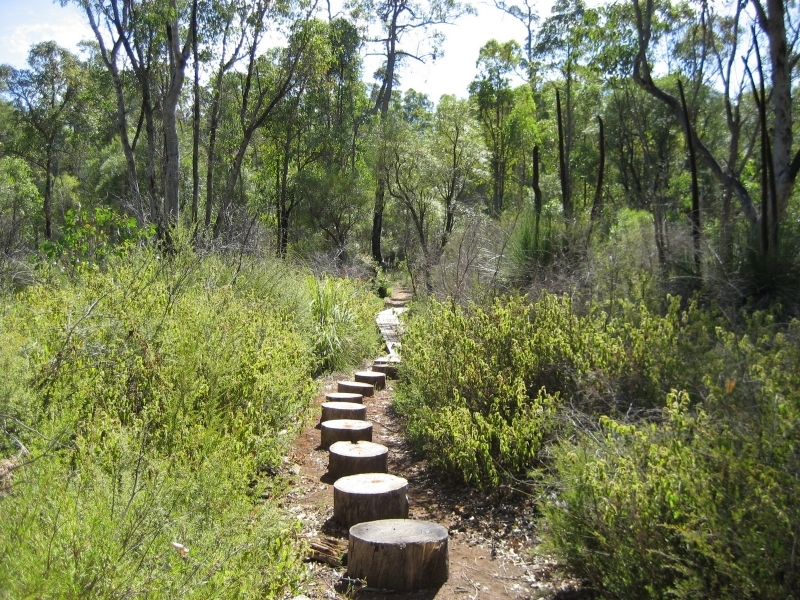 Vegetation varies from diverse swamp areas such as the 'plonkhole' south of Dee Vee Road, to the old growth jarrah forest and sandy flats of the Lane Poole Special Conservation Zone around Yourdamung. Further south Lake Balingall, formed by the damming of the Harris River in 1989, provides habitat for many waterbirds. The Harris Dam picnic area, 15km north of the town of Collie, provides good access to the Track and it’s a pleasant return walk from the picnic area to Harris Dam campsite. South of Harris Dam the Track is linked to the town of Collie by a 3km spur trail. 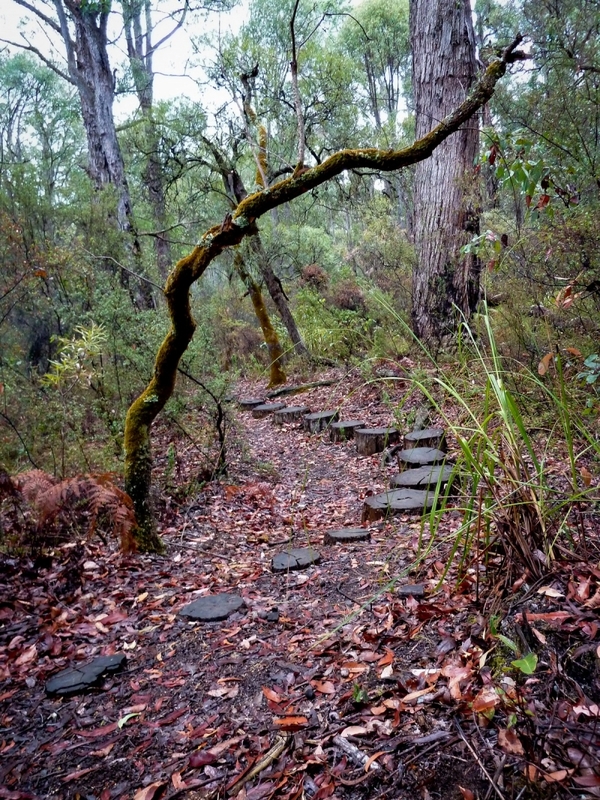 For more information on walking from Dwellingup to Collie go to the Section by Section Guide.